Sometimes I wonder if the industrial genre I remember from the late '90s has completely imploded long ago in self seriousness but then the laser beams of light from Blessure Grave or Lust for Youth remind me this can be a viable expression that should be revisited. 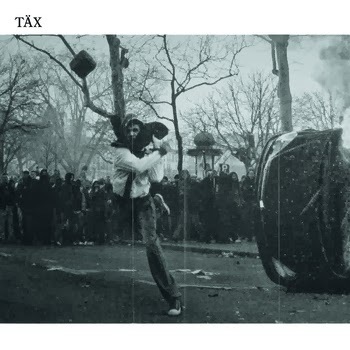 Sean Bailey, Justin Fuller and Simon Taylor are TÄX out of Melbourne who is making a serious case for not only Industrial's music possibilities but that it could have real impact when used in a political context if I'm taking anything away from the multiple burning riot images on the sleeve. A-Side's "Bent Spear" took me right back to Skinny Puppy with a big chorus of distortions and all three members are behind these vocals while the drums pound away in that early nineties sound. It's dark, of course, but paired with an aggression and a real snarl. The electronics poke out and ground this into that synth period when it was in every house. The lower fi, no budget industrial attempts used to fascinate me because unless you had that equipment it just souded like it was completely from another planet. This is insanely dark. Fear the future. But not in a nihilistic punk way, this is a real calcualted jab at that genre and some of it's strengths. The drawn out distanced chords mirror the vocals that are somewhat buried in that eerie underground way. The baselines here even echo's early Joy Division which could have easily turned in this direction eventually. These three are taking it on, there's no poetic acceptance or giving up, like their imagery inside, they're fighting. B-Side's "Arms" is pure industrial mechanics in the form of feedback and heavily echo'd snare. These instruments are their new industry. This guitar sound is gritty and garage-y but it's sweeping out over this huge sonic area. The drums have a Cure sense of distance while that massive Jesus and Mary Chain guitar binds this straight into that thousand pedal effects slowly falling away and I never even realized how closely related this density is related to shoegaze. They come up with a chant and abandon the usual kind of melody opposed to those antiquated delivery systems? Or it lives in that primal place that doesn't need to embellish. The tom polyrhythms and washes of distortions blend together in this final part of the track with a Bauhaus style vocal from Sean Bailey, it isn't very hopeful and makes for a real clear vision of the fucked up future we're headed towards and already in. Pick this up from No Patience direct or Goner or Negative Fun have it stateside.